I’ve been waiting for this feature for a long time. Now when you click an email hyperlink while browsing with Chrome you can set it to automatically compose a new message from the Gmail web interface. Whether you want to set it up or disable it, you can find the instructions here. In a recent update to Chrome, Google enabled a new website handler feature. You might have noticed the permissions button that now appears whenever you login to Gmail using Chrome. If enabled, Gmail will automatically open and compose a new email message addressed to the email you click on while browsing the web. If you’ve enabled it and want to undo that, follow the instructions below. Login to Gmail using Chrome version 18.0.1025.45 or later. At the top of the page you should see a permissions bar asking for permission to “Allow Gmail (mail.google.com) to open all email links?” click Use Gmail. 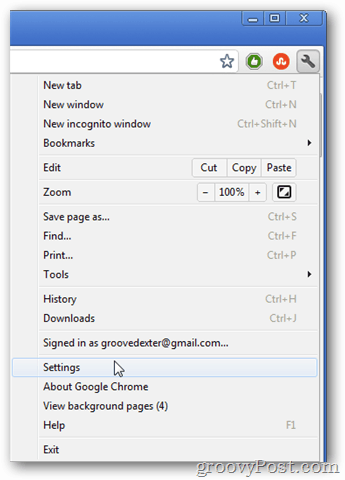 Open Google Chrome and click the Options (wrench) button at the top-right of the browser. From the drop-down list select Settings. Navigate to the Under the Hood tab and click the Content settings… button. Scroll down to the Content Settings list and click the Manage handlers… button. All of your active (installed) protocol handlers will be listed on this page. 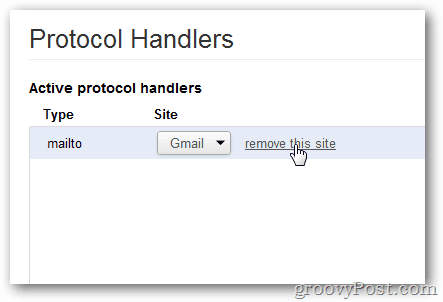 Click the “remove this site” on the mailto handler to remove Gmail as your email link handler. Once removed, your system will revert back to opening email links in whatever default program you have assigned it. I stupidly clicked to allow Gmail be the main content handler without thinking what I was doing. I have now removed Gmail a a content handler but now the mailto: links won’t open in my email app (mac Mail.app) and there seems to be no way to set this. I am having the same issue as Kyle. Please let me know if you find a solution. Go to Mac Mail > preferences> General > Default Email Reader. Select the dropdown and reset it to Mail.app (4.5)…..
Great, thanks! This has been bugging me for a week or so. Now email links open Outlook like they should. I too stupidly clicked to allow Gmail to handle links. I removed the permission according to these instructions but now when I click on an email link instead of opening a new message in Outlook as it did, it just goes to chrome on whatever page I was on. If Chrome is shut clicking on an email address opens to my home page. Finally figured it out. Downloaded Mozilla Thunderbird email program and let it be the default. Closed it out. Opened up my preferred email program and it asked if I would like it to be default… Yes. All fixed. I am very satisfied with the way google handels my things. There is just one thing that I do NOT appreciate: the sent on behalf. I have 5 different mailaddresses, and gmail is my mailapp. I would rather send my mails from the account that I have chosen in the top of my mail. Anybody any idea how to achieve that? what about gmail w/out chrome? Thx for your reply. Maybe that will do the job, but I am very satisfied with chrome, it is absolutely the fastest and most handy browser. THANK YOU so much for this. One day Chrome just started doing this and I was going crazy trying to figure out how to fix it. Thank you thank you thank you. 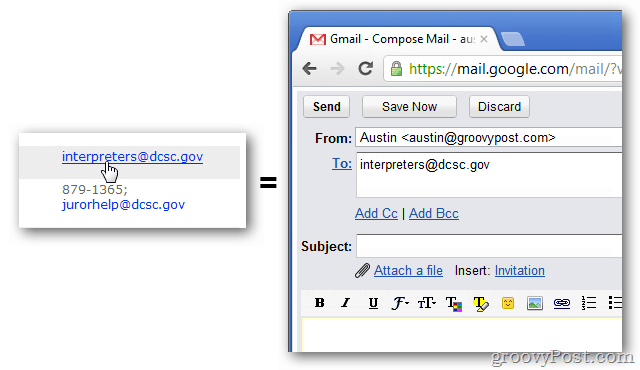 “Allow Gmail (mail.google.com) to open all email links?” . How can I now change it? Trying your instructions with Chrome 22.0. There is no such thing as a “Under the Hood” section in the settings. In fact, not much of anything in the settings looks like your screen shots. So the instructions no longer work, apparently. Need to find someone with *current* instructions. I’m having the same issue as Kate. I *want* to add gmail as the default in Chrome but in the past clicked ‘no’. How do I get it to ask again or otherwise add the handler Chrome? Where are you when you go to Mail Application? In other words, where do you start from? Thanks. hi, are these instructions still valid? 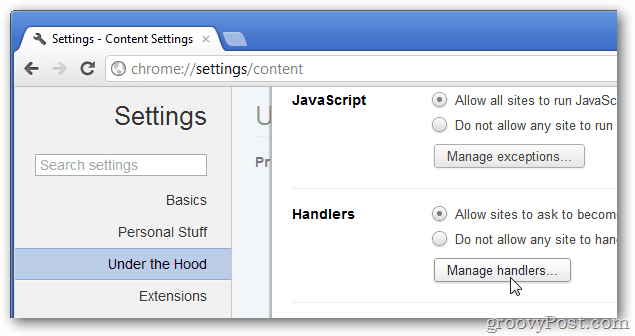 i don’t see “under the hood” in chrome settings. Is it necessary to go into the ‘advanced’ section? I don’t have Chrome installed and Gmail opens instead of Thunderbird when clicking an email address. I am using Linux Mint Cinnamon. Thank you – your tip worked. This isn’t the case on my W10 version of Chrome v62.0……blah…. There is no ‘Under The Hood’ tab.